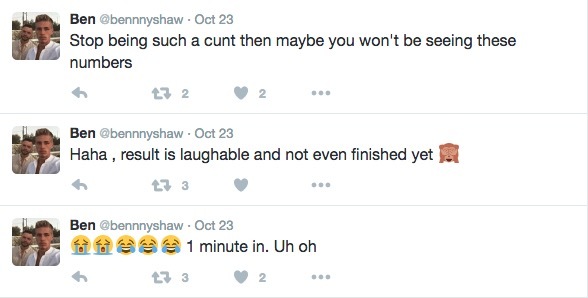 Luke Shaw’s brother, Ben Shaw, has blasting Manchester United manager Jose Mourinho on twitter, over the way he has been treating the young left-back. Back in September, following Manchester United 3-1 defeat in the Premier League at the hands of Watford, Jose Mourinho was seen publicly criticising Luke Shaw for his poor performance, which led to the Red Devils conceding a goal. Jose questioned Shaw’s lack of desire to press the defender, and also his tactical and mental attitude. Following Mourinho’s public criticism, reports of a falling out between him and the 21-year-old began to emerge, with many news outlets stating that Shaw was unhappy at being singled out. Those reports only grew stronger last Sunday, when Jose Mourinho decided not to include Luke Shaw in his team to face Chelsea at Stamford Bridge, despite the defender being fully fit. 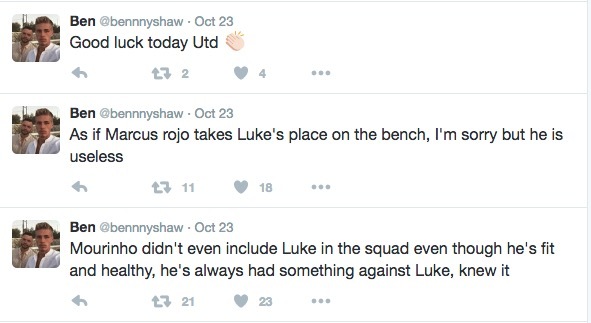 Many United fans failed to understand the reason behind Shaw’s absence, but there was one person in particular that did not take Jose’s decision too well: Ben Shaw. Ben, Luke’s brother, took to social media to express his anger, and even stated that Mourinho always had something against Luke. He lost the plot entirely after United conceded the early goal, and even went to the extent of calling Mourinho a “c*nt”. However, Ben has now changed his twitter account’s privacy setting to private, and has also refuted the claims that it was indeed him who posted the aforementioned abusive tweets.